Santa Sabina is the 5th century basilica on the Aventine hill, just south and across the Tiber from the Vatican, that has served as the home of the General Curia (read, worldwide headquarters) for the Order of Preachers since not long after they were founded by St. Dominic in the early 13th century. In the midst of finals, one of my Dominican classmates, Benedict, offered to lead a small group of us through the basilica and adjacent buildings. A half dozen of us gathered in the very rooms of the founder for mass, both of which were thankfully de-baroquified some years ago. This was another of those inspiring, unscripted days offered by life in Rome, when you can walk in the footsteps of saints and get a taste of the diachronic communion of the Church. We wandered the hall where Thomas Aquinas slept, studied, and eventually composed at least part of the Summa and other works. The dining room remains the same one that fed the Great Ox. An incredible view of the city and St. Peter’s awaits on the north side. 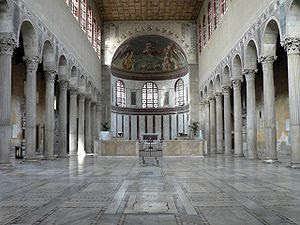 The basilica itself features some unique mosaics and even a stone that pious legend holds was thrown by Satan himself to distract Dominic from prayer. (Another, slightly more recent legend holds that if you touch the stone and it feels cold, you are in a state of mortal sin and must be confessed by a Dominican immediately. Conveniently, the stone is as black as obsidian and kept indoors year round.) Pius V was another resident of the convent, and is often the pope credited for “creating” the tradition of white as the papal color, by refusing to shed his Dominican habit for the then-normal scarlet after election. Whether accurate or not, it is true that Pius V should be well known for publishing the Roman Missal that was the norm for the celebration of the Eucharist throughout the Western church for four centuries – now known most commonly as the Tridentine Rite. In the neighborhood we also stopped by the basilica of Sant’Alessio and the most famous keyhole in the world, at the headquarters of the Sovereign Military Order of Malta. 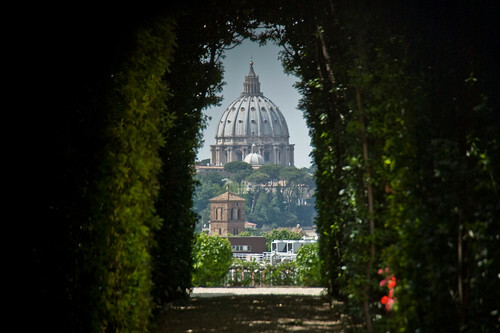 There, standing in Italian soil, you can gaze through a garden belonging to the SMOM and see a perfectly framed view of the dome of St. Peter’s – three countries in one keyhole. Across the piazza sits the Anselmo, the Benedictine pontifical university that is the traditional center of liturgical education in the Church (outside of Notre Dame, of course!). By A.J. Boyd in La vita Roma on June 4, 2010 .